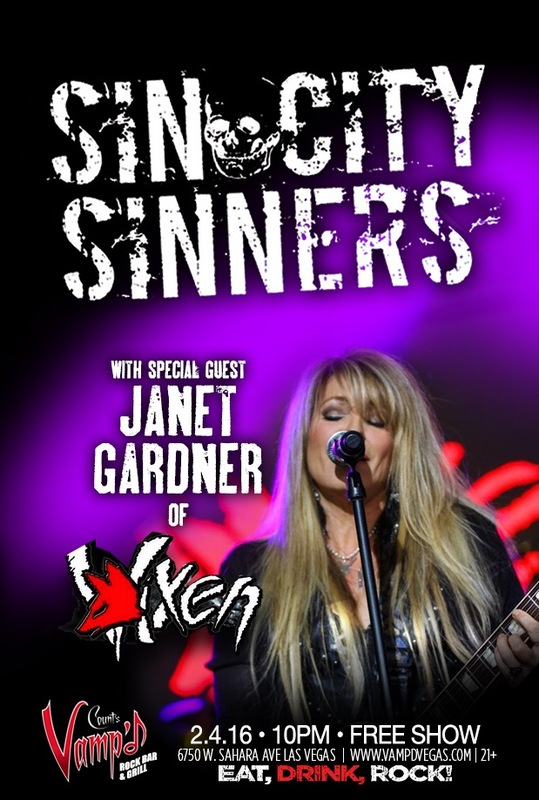 Home›Reviews›Sin City Sinners - Vixen Vocalist Janet Gardner Jams with Vegas' Hardest Working Band! 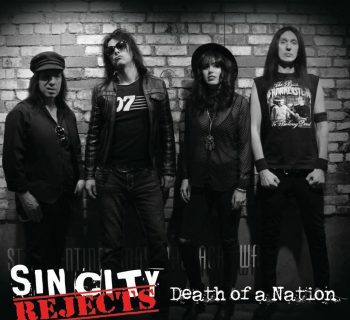 2016 is off to a fine start on the rock and roll scene, and with their new album due out later this month, the Sin City Sinners are proving to be no exception to this rule. Everyone knows the Sinners have a reputation not only as solid musicians in their own right, but also in that they bring out special guests to further enhance their performances on select occasions. 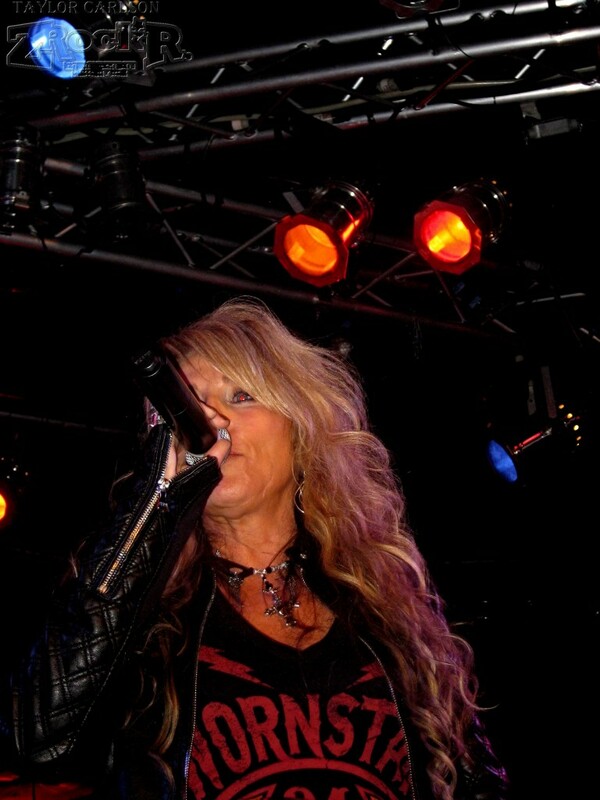 On this particular evening at Vamp’d, the band was joined by none other than Vixen leading lady Janet Gardner! This was a bit of an unusual show in that half of the band had substitutes playing, due to vocalist Joshua Alan’s illness, and guitarist Michael “Doc” Ellis’ absence on a vacation. Bassist Scotty Griffin and drummer Blas Elias were both present, but filling in on the guitar was young virtuoso player Blaze (who plays alongside Sinners members in Ratt). On vocals for the evening, at the last minute, was Love/Hate vocalist Jizzy Pearl, who has in recent years been making strides as the frontman of a revamped Quiet Riot. 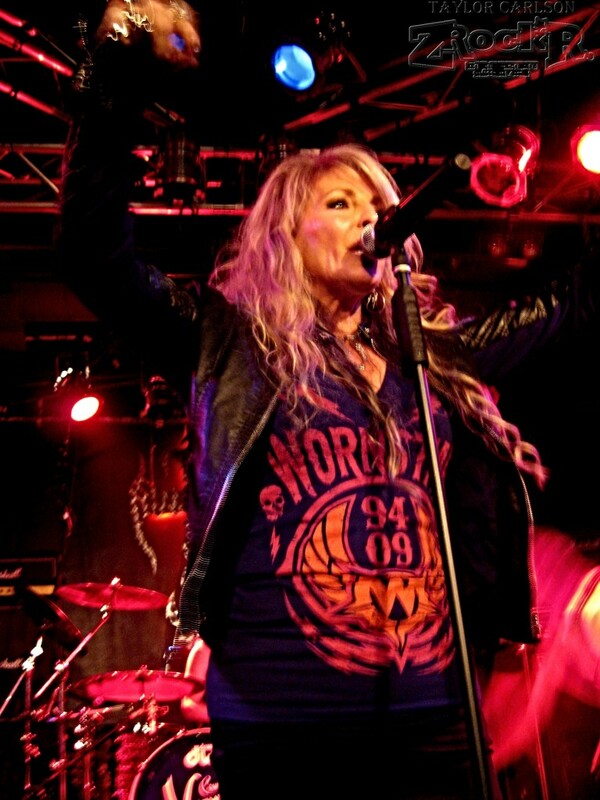 The Sin City Sinners played Vamp'd with Vixen singer Janet Gardner. Blaze and Jizzy Pearl were filling in with the band. As per most Sinners shows, this one started out with a set featuring just the “main” band. As Joshua Alan was missing, it was relegated to an assortment of covers, including bands like Guns N Roses, Dio, and Van Halen. Pearl nailed these songs brilliantly; this guy has a definite stage presence and an unmistakable vocal style that lets him turn any tune into his own. Disappointingly, no Ratt or Love/Hate tracks were performed (Pearl once fronted Ratt), but one comment made by the band implied that there may have been legal reasons for not doing those songs. The high energy displayed by the band for this set definitely showed fans that “Hardest Working Band in Vegas” is not just a nickname; it is an earned title! And then, of course, came the event that had people eager for the evening; the arrival of Janet Gardner! It has been nearly three decades since the Vixen debut came out, but Gardner still looks great and has both a powerful voice and stage presence. She was always severely underrated in the music world, but this evening’s worth of performances proved to the fans that she is every bit is much the performer today that she was in the Vixen heyday. Of course, we had the obligatory Vixen hits in the set – “Rev It Up,” “Edge of a Broken Heart,” and “Cryin.” All of these songs were done justice by the band, and an additional special guest even came up for a number of songs – Tyketto’s Justin James! Further adding to the Gardner setlist were covers from bands like Bad Company, Led Zeppelin, and The Beatles. By the time it was all said and done, plenty of musical ground had been covered, and this surprisingly large Thursday night crowd had gotten more than they had expected. The Sinners never fail to please their audience, and Gardner made for a fantastic musical guest who definitely had the rockers at Vamp’d on their toes. Hats off to Jizzy Pearl and Blaze for stepping up to fill in as well. This promises to be a great and eventful year for the Sinners, and this fan will be there for all of the impending rock and roll!